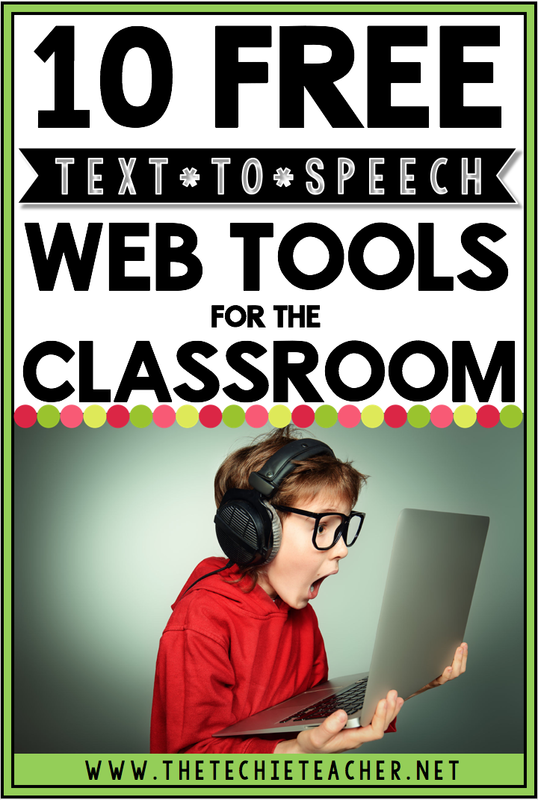 10 Free Text to Speech Web Tools for the Classroom | The Techie Teacher® . Are you looking for FREE text to speech technology web tools that do not require downloading software and can be used on Chromebooks, laptops or computers? There are a lot out there. Here is a list of 10 different easy to use text to speech (TTS) tools students can use to assist with text read alouds as well as their own writing. TTS technology is also a helpful tool for ELL students and those who struggle with dyslexia. Text to Speech with Google Drive is a text to speech converter that allows you to listen to text with your Drive files! It will even read PDF files that are stored in your Google Drive. It supports pdf, doc/docx, ppt/pptx, html, txt, ps, Google Docs, Google Slides, odt, odp and any text files. I really like this one because it will allow students to select exactly where they would like the voice to start reading. They can easily go back to listen to a sentence or set of sentences. The text is highlighted. You can choose to have each sentence display in a large blue rectangle as it is read aloud. Or you can simply have the file displayed. The free version of Natural Reader will give you 20 minutes with premium voices per day. Select and Speak is a Chrome extension that will allow you to select text on any website (including Google Docs) and have it read aloud. 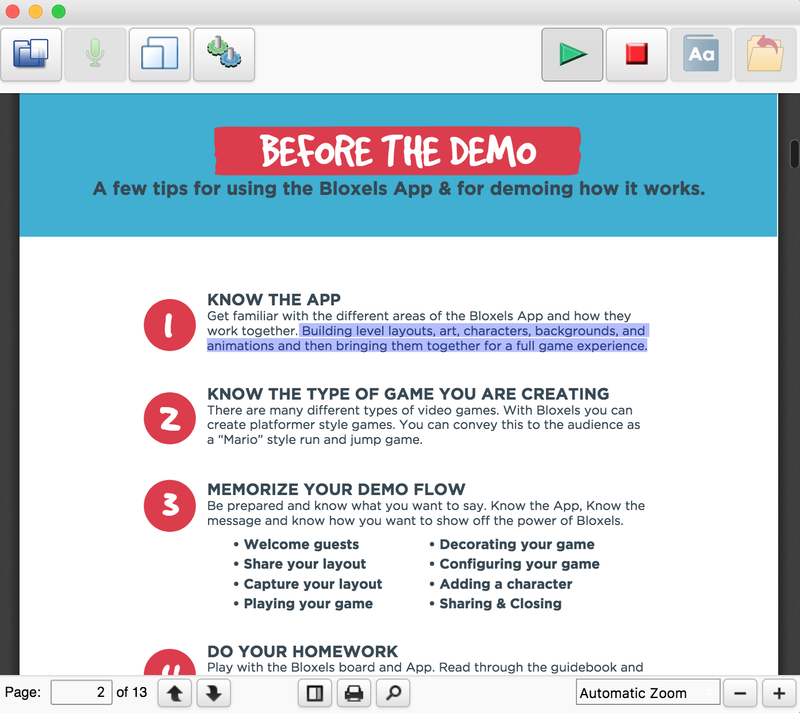 Highlight the text you want to hear, click the extension icon and the text will be read aloud. 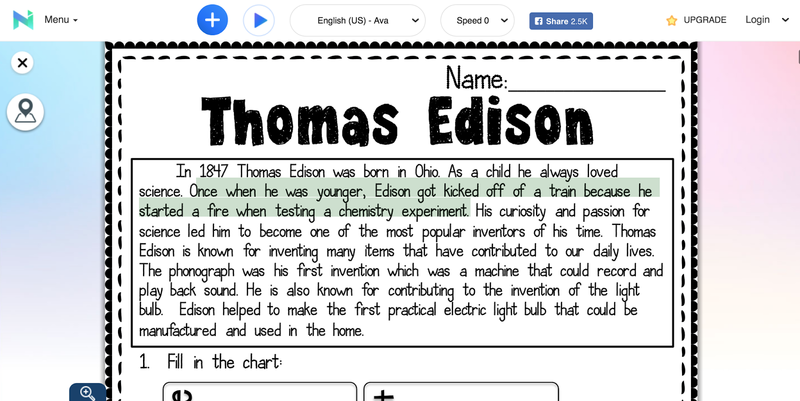 Read Aloud is another Chrome extension that will read text aloud from any webpage, including Google Docs! 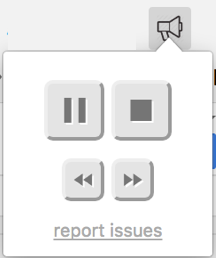 Just click the extension icon and it will start reading the text aloud. You can even use the keyboard shortcut Alt R to activate this extension. This is also a FABULOUS tool to help students with their writing. 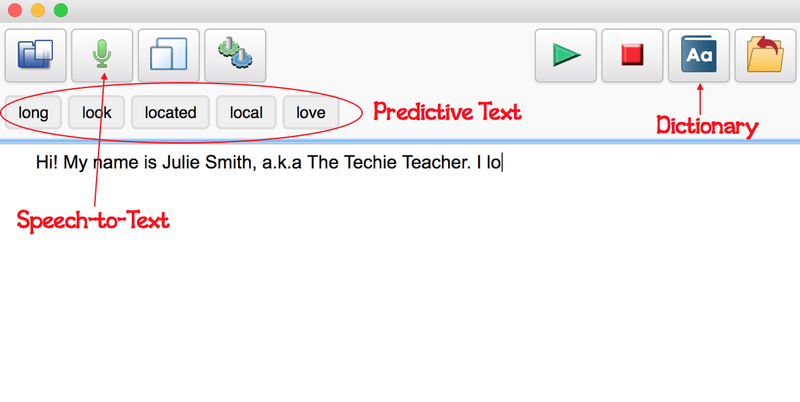 Predictive text, dictionary and speech-to-text tools are all available! Claro Speak in one of my favorites! 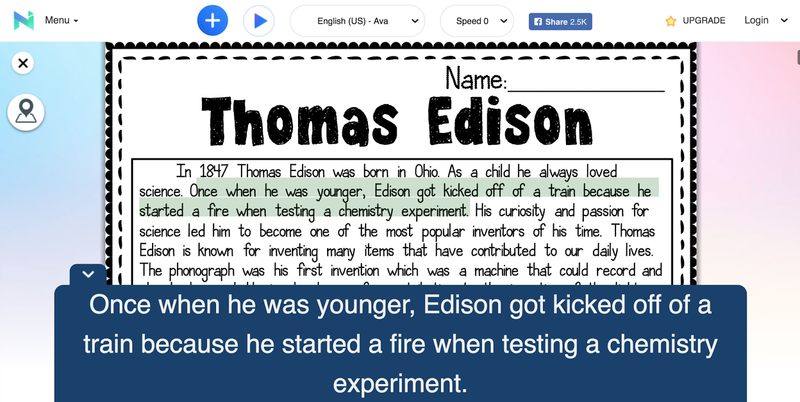 Chrome Speak is a Chrome app that will read any text on a webpage. 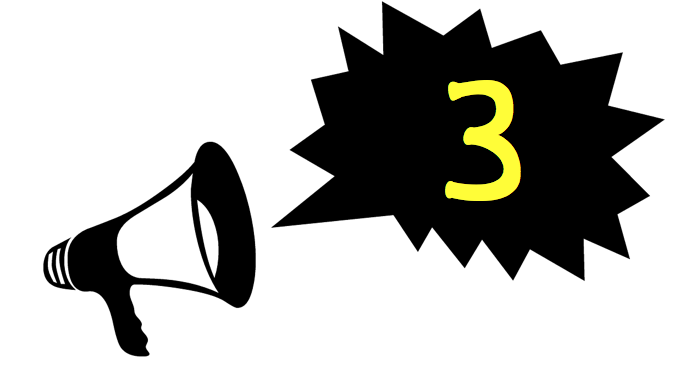 (This one does not work with Google Docs) Highlight the text you would like read aloud, right click, Select Read with Chrome Speak and the text will be read aloud. 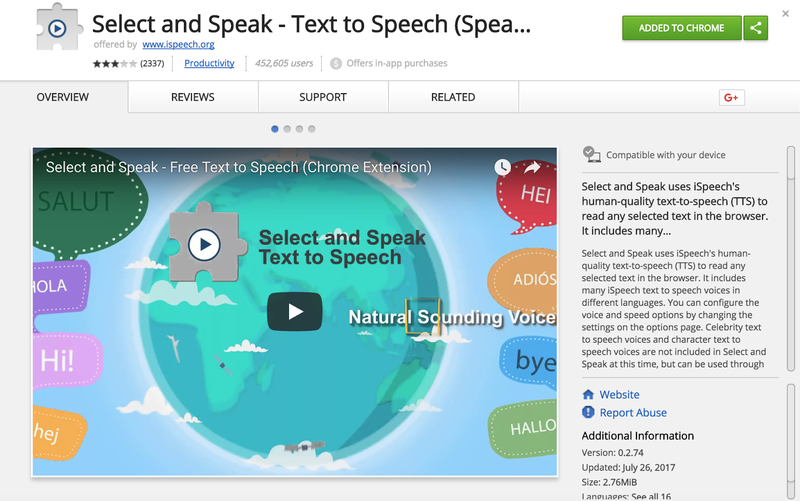 Chrome Speak has many options as far as voices, reading pitch and reading speed. Text2Speech is very simple and easy to use. Enter your text, select a voice and talking speed and then press Start. You can listen to the text as well as download a mp3 file. 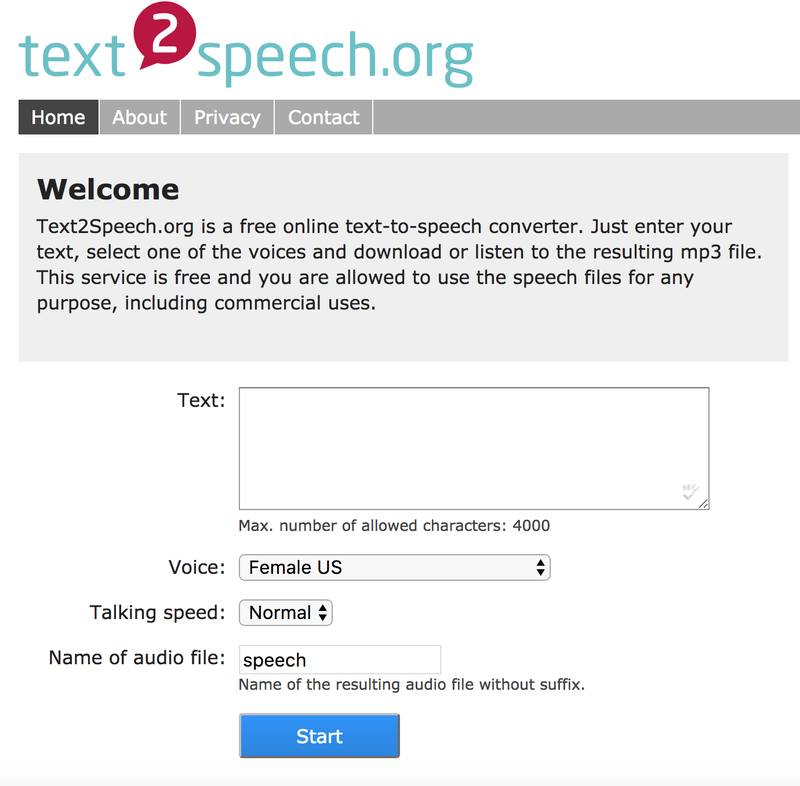 iSpeech is a free text-to-speech web tool in which you can paste text into the text box, choose a male or female voice, select a language and press play. 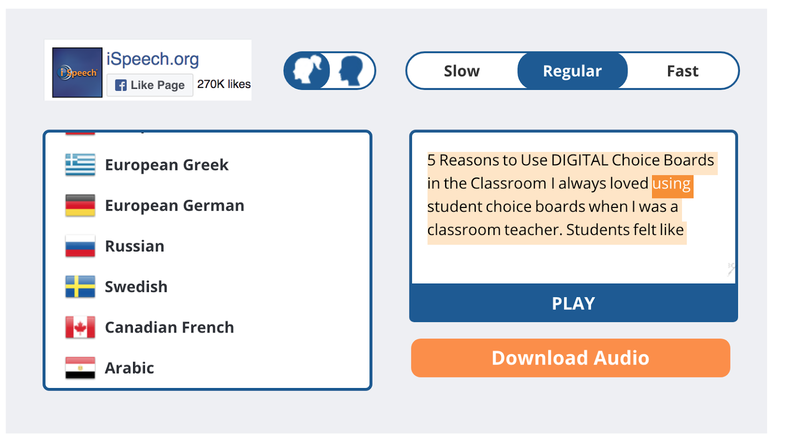 VozMe allows you to type English, Spanish, Italian, Portuguese or Hindi text and will read the text aloud as well as let you download the file as an mp3. I like for students to use this one when writing. They can copy and paste their text into the box and the web tool will read aloud their writing. Great tool for the editing process! 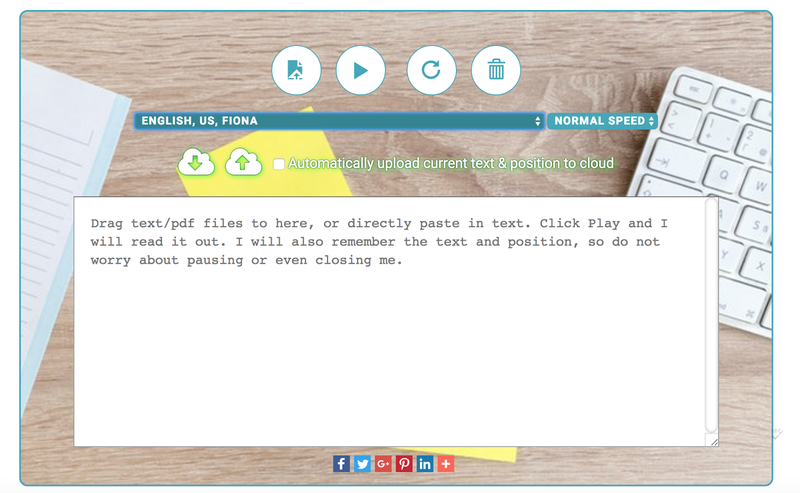 Text to Speech Reader is a website that will allow you to upload a PDF, an epub file, paste a text or type your own text to be read aloud. Multiple languages and accents are available to choose from! It will only work on Chrome or Safari browsers. 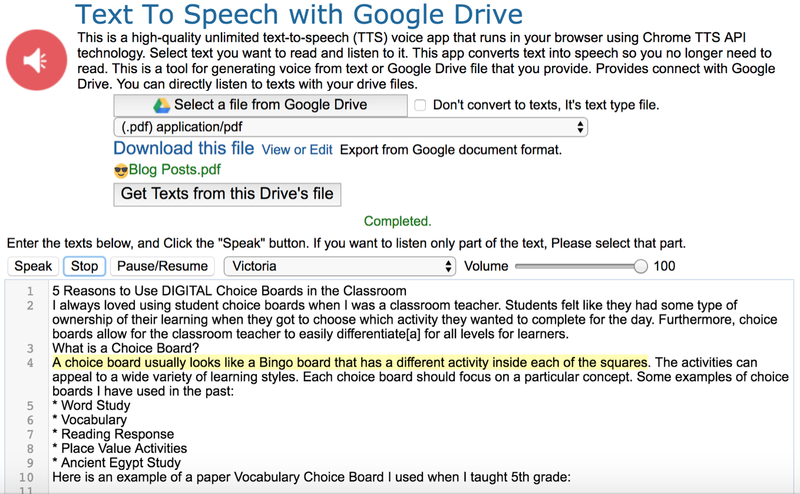 ☺Chromebook Built In Chrome Vox is the built in text to speech tool availble on Chromebooks.